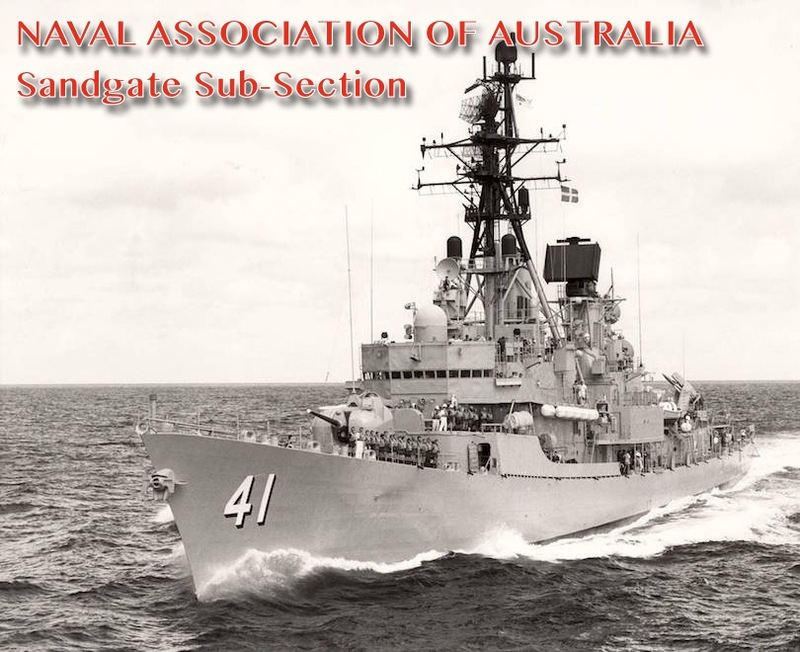 In line with the Naval Association of Australia’s (the “NAA”) national president’s call for every Sub-Section to bolster the Four Pillars of “Camaraderie”, “Navy Cadets”, “Commemoration” and “Care”, Sandgate is making headway on all four fronts. In July 2017 the Sub-Section took the view that, in order to engage more successfully with the outside world and to showcase how our members were making a positive contribution to the community, additional channels of outreach – “online” – were worth actively exploiting. Many of our Sub-Section’s members are veterans now edging into their seventies. We are all extremely proud of the direct financial and moral support we strive to provide to the Australian Naval Cadet unit, “Training Ship Paluma” with whom we share meeting room facilities. Like so many community-based/volunteer-run/not-for-profit organisations across the world, we have to negotiate a very busy and competitive “marketplace” of ideas, interests, lifestyles and time-pressures. We won't know for certain until ex-RAN veterans who have served not more than 10 years ago start to find their way to us and discover the hospitality, fellowship and satisfaction of being with like-minded, community-focused veterans. Until then, Sandgate Sub-Section is “keeping the harbour light shining” with the following social media/online resources. We humbly commend them to other NAA units as a potential template for engaging current generations of sailors and to showcase what NAA membership can achieve locally, and ultimately nationally. Dozens of Facebook “group pages” focused solely on sharing camraderie among those who may have served on specific ships, or a class of warship, are out there waiting for you to explore. Once you have a story you’d like to share, the men and women who populate these virtual meeting places will do the rest. If you think your Sub-Section has a “voice”, why not set up a Facebook profile and let the world know you are ready to join the conversation? It’s all free and no matter how hard you try to convince yourself that you are too cack-handed to master “a computer”: what do you imagine that smartphone in your hip pocket is? Yep! Like your grandchildren will remind you: If you can make and answer a telephone call on a mobile phone, you can just as easily click on a Facebook icon and see what’s new in your Sub-Section. And when you do, let our Sub-Section know you’ve joined the 21st Century...we will give you a shout out and “like” what you’ve got to share. Hard to imagine anything useful can be found on the Internet? 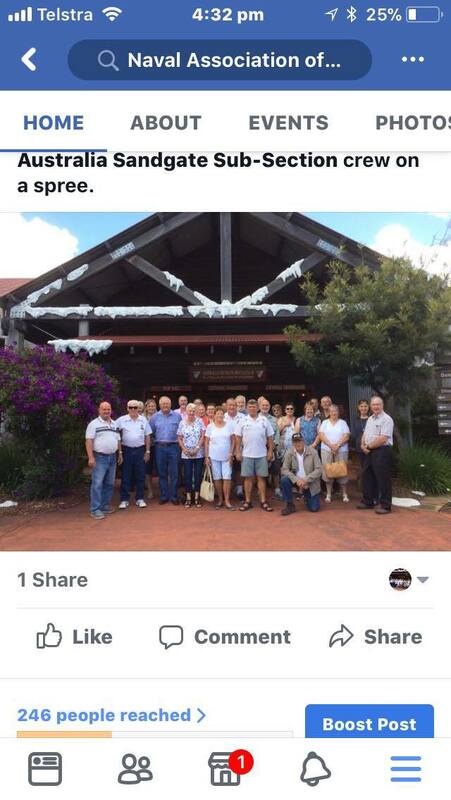 Take a moment and look up, for example, the “HMAS Vampire” Facebook "closed group”. At last last count, some 799 former matelots are freely sharing their quirky sense of humour, nostalgia, photos and history, arranging reunions, selling or swapping souvenir paraphernalia (like t-shirts) and a whole lot more. These former crewmates are re-establishing the bonds only veterans truly understand and value. Their tiny corner of the Internet has become, for them, an irrepressible expression of connectedness among the several generations of sailors who just so happened to have gone to sea on this one warship, but now online. So there you go. “Bravo Zulu!” for browsing past our little corner of the NAA national website, and we sincerely hope you’ll return again soon. Let's know you're out there, won’t you? The Sandgate Sub-Section's multi-purpose trailer is a "familiar face" outside Bunnings Carseldine once a month. Why not drop by and say "hello" (and grab a deliciously-prepared Sausage Sizzle - with or without onions - for just $2.50) this month. Check our FB page for dates. HMAS Brisbane (II) D41 under way. On a group bus tour to the "Salute to The Light Horse High Country Special" at the Australian Outback Spectacular at Oxenford, near the Gold Coast. From our Facebook page feed. At your service. 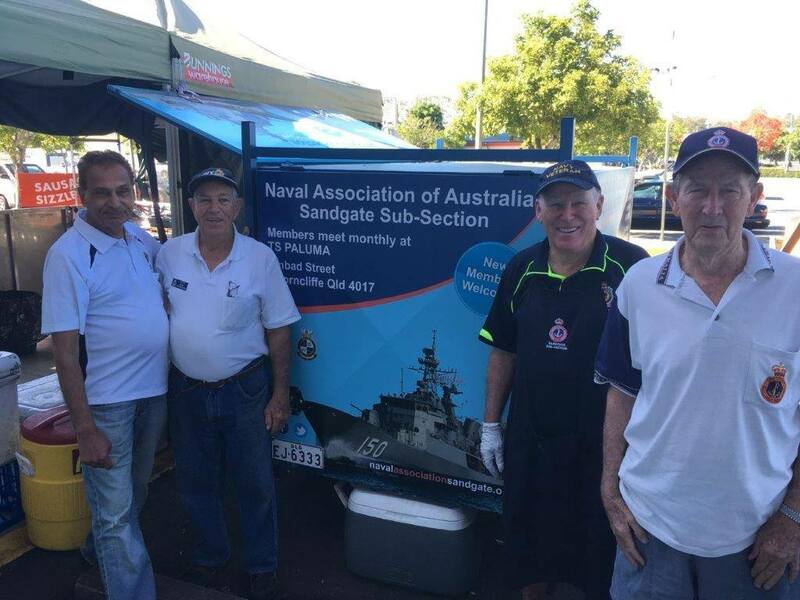 Some of our Sandgate Sub-Section volunteers at the monthly sausage sizzle fundraiser at Bunnings Carseldine. 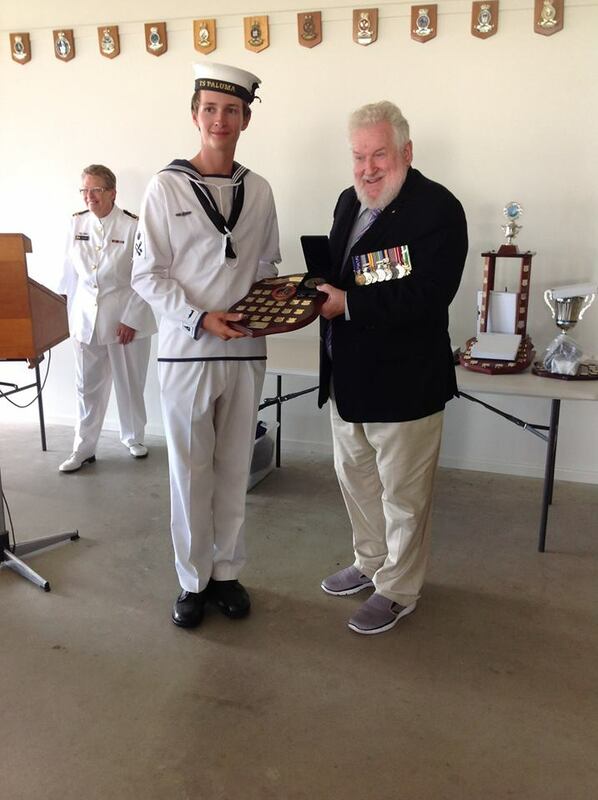 CDR Nield presents a prize to a Training Ship Paluma Australian Naval Cadet. Fellowship, Sandgate Sub-Section style: The group shot taken at the "Salute to The Light Horse High Country Special" at the Australian Outback Spectacular at Oxenford, near the Gold Coast, in 2017. 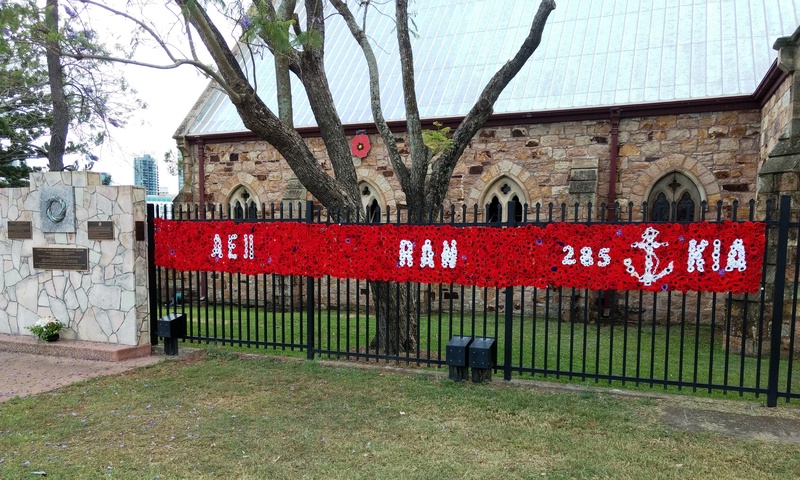 The "Wall of Honour" flanking the Canon Garland Memorial - ANZAC Day Origins beside St Mary's Anglican Church, 455 Main Street, Kangaroo Point, Brisbane, on 11 November 2018: the Centenary of Armistice Day. 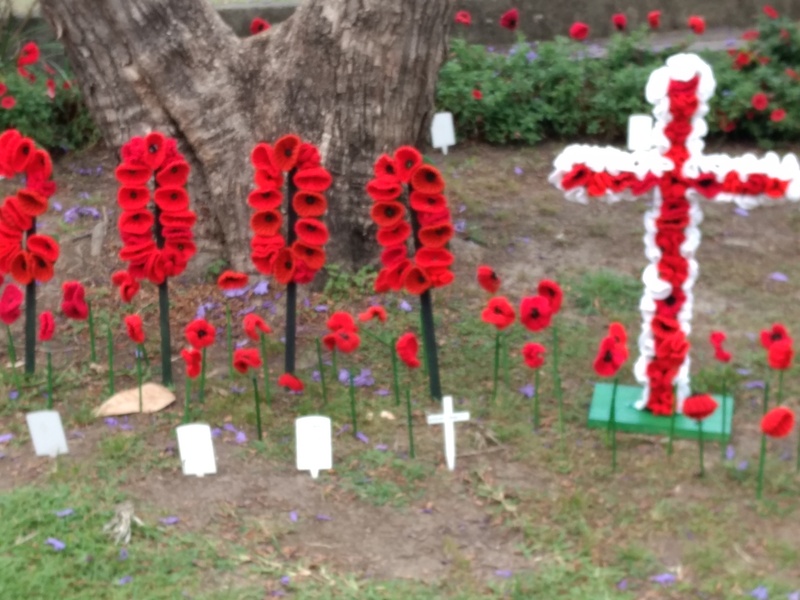 Some of the 14,000 handmade woollen poppies that volunteers from across the eastern seaboard knitted and crocheted to turn St Mary's Anglican Church, Kangaroo Point, into "Fields of Poppies". These shapes were crafted by Sandgate Sub-Section President, Darby Ashton. The Sub-Section's contribution to the success of the day was substantial, and mutually most satisfying. Camaraderie: Sandgate-style! 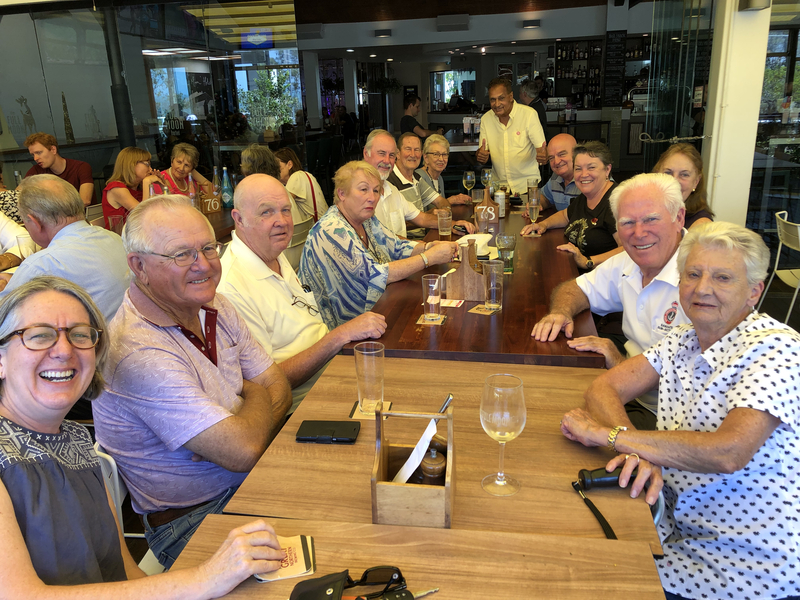 The Sub-Section mainstays who serve up fund-raising sausage sizzles each month outside Bunnings Carseldine gather for a "thank you" luncheon at Shorncliffe's Blue Moon Hotel on Saturday, 1 December 2018. Come say "hello" the next time you see the Sandgate Sub-Section shingle at Carseldine! The now-shipshape demountable teaching rooms donated by the Sandgate Sub-Section to further the training outcomes of the Australian Naval Cadets of the Training Ship Paluma at their Shorncliffe base. Sub-Section volunteers painted the facility and are in the process of outfitting it with teaching resources. Sub-Section Treasurer, CMDR Darryl Neild OAM (Retd. ), makes a point about the impending presentation of a Sub-Section paid-for trip aboard the Training Ship "Endeavour" to one Australian Naval Cadet in 2019. Training Ship Paluma Unit Committee president, Bob Grant OAM, listens intently before being handed the relevant paperwork at the November 2018 Sub-Section meeting. The placemat design for the Sub-Section's Christmas break-up meeting on 9 December 2018 was designed by the Sub-Section's Honorary Webmaster, Peter Collins, with lamination donated courtesy of Sub-Section member, Kaye Ross. 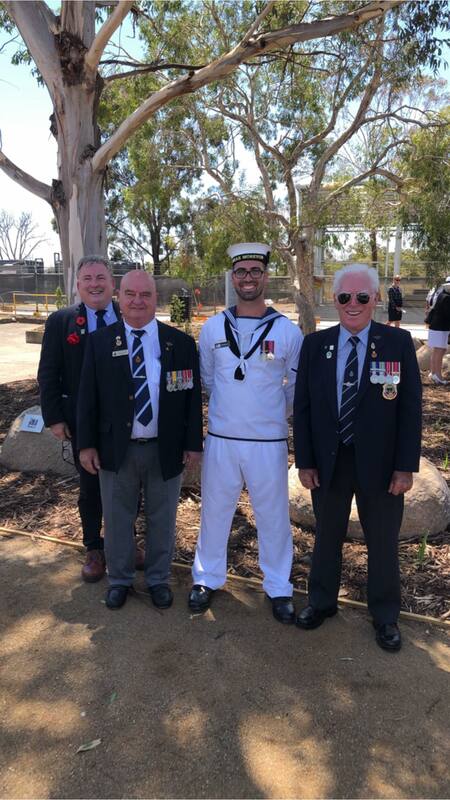 On 30 January 2019, LSML-SC Hayden Eyles was presented with an Australia Day Medallion by His Excellency, the Governor of Queensland, the Honourable Paul de Jersey AC QC, in the presence of Captain Stephen Bowater OAM RANR, and invited guests, at HMAS Moreton. BZ, from all at the Naval Association of Australia Sandgate Sub-Section. From left in this photo are Sub-Section Honorary Member, Peter Collins; Sub-Section President, Darby Ashton; LSML-SC Hayden Eyles; and Sub-Section Vice-President, Allan Bird.